New month, new author to fall for! If you’re not already familiar with Rebecca Barrow, please allow me to help you fix your life. 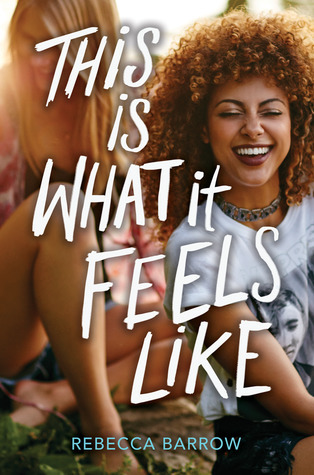 She’s a contemporary YA author whose sophomore novel, This is What it Feels Like, releases on November 6, and if you’re a fan of authors like Emery Lord, Nina LaCour, and Katie Cotugno, I guarantee you wanna check her books out! Let’s jump right in to your new release, which you already know I’m obsessed with. What’s This is What it Feels Like all about, and can you particularly tell us about Jules and her romance? So This is What it Feels Like is about three former friends-and-bandmates who get back together to try to win fifteen grand and have to work through the past that tore them apart in order to succeed. Jules’ story is really about what happens when she meets a sweet, fun new girl and has to deal with the relationship Expectations vs Reality thing she has going on. She’s a super romantic and her last (first) relationship didn’t really work out well. And a big part of her character is this quiet fear she has that she won’t ever get to be in a happy, ideal relationship with another girl. I originally wrote her getting back with the ex and dealing with all the drama of their relationship again, but there came a point when I thought—why am I giving her this unhappiness? Why can’t she meet someone who gets her and write her getting to explore happiness and her shifting perception of that notion? So, I did. 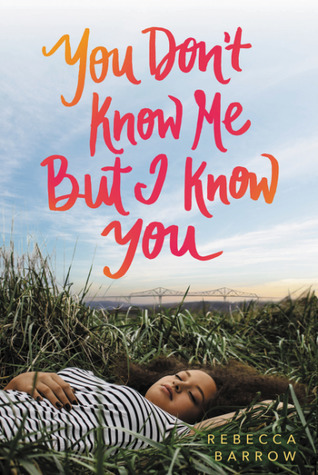 We see a lot of the “gay best friend” in YA, but I think Rose in You Don’t Know Me But I Know You might’ve been the first bi best friend I’ve seen in YA, though it’s definitely been a growing trend since. She’s such a great character, too; what about her really spoke to you? First of all, thank you because I know some people really don’t like her but I love her, mess and all! I didn’t set out to write The Bi Best Friend; when I first started writing Rose, the book was dual POV and she had her own thing going on. So really she got shifted into that role as I found the heart of the story and stripped back to just Audrey’s POV. But writing Rose was one of those moments that I know plenty of authors have had, where you write a queer character because you’re just SUCH a good ally! and then you stop and realise that ohhhh wait no okay it’s all clear now. So I guess what spoke to me about her was…myself?! I wrote her bisexuality not realising that it was also my bisexuality. And she’s similar to Jules in that she’s very certain of her sexuality and also very afraid that any relationship she gets into is going to go terribly. I guess..am I just writing my own fears again?! Possibly! It was definitely enjoyable to write a girl who’s so sharp and spiky but not a stereotype. You’re a very interesting case of being a British author who publishes in the US, despite there being a reasonably thriving UK YA scene, and sort of a queer UK YA subscene. How did you come to the choice to publish this way, and what differences do you notice in the different publishing communities? I didn’t intentionally set out to publish in the US; it was just a kind of unfolding of events that now I think works in my favour. I do write books set in the US, because I was raised on US media and I loved USYA and it was just what I started out writing. Then as I became more knowledgeable about publishing, and as the push for increased diversity has happened—well, as much as the US still has far to go, the UK has even farther. Specifically for the books I write, with black and sometimes queer girls whose stories don’t revolve around black pain and who are somewhat outside the stereotypical/publishing-approved narrative, it can be hard to find a place for them, especially in the UK. So while in the beginning it wasn’t a move I made specifically because of what I write, it is now something I definitely think is in my best interests and that I wouldn’t take back. The UK scene is complex because while there are marginalised authors putting out great UKYA books and a very enthusiastic community of people supporting them, it also feels—to me, at least—overall still quite stuck in the past. So a lot of the books that are really successful here have that old school children’s lit feel of magic and mysteries, and younger protagonists, and some of the older and more diverse books don’t reach the heights they really should. Then there’s another odd thing in that in the UK, in the past, we didn’t have YA as such—it was more of a children’s/teenage divide. So if you were to pick up a book in the teenage section, it could be something dark and gritty with an 18yo MC, or it could just as easily be a fun adventure story with a 13yo MC. And as YA has exploded, what’s really happened is that successful USYA is being brought over here and kind of flooding the space. In terms of diverse fiction, then, what often happens is people will point to the success of a USYA title in the UK, but not really register that we’re still not supporting diverse UK talent enough. Which kind of comes back to the question of why I publish in the US—it’s all a bit of a self-perpetuating cycle: USYA gets brought over, UKYA isn’t bought, UK authors seek to publish in the US, their US-published books get brought over, support still isn’t there…and rinse and repeat. It’s very complicated and as far as I can see, the answer really is for UK publishing to step up and buy/nurture/support works by marginalised UK authors. Until that happens, this cycle will continue. But I do want to shout out a few people doing great work—Stripes puts out great diverse books and brings in unknown talents to write in their anthologies, several of whom now have solo deals. Knights Of is a new publisher focused on diverse lit—they just put out Jason Reynolds’ For Every One. And there are so many individuals working hard—we just really need the machine of publishing and a lot of the book-buying public to step up, too. In the future I would love love LOVE to be published in the UK as well as the US, and hopefully find a space for my books. Black girls barely get their due in YA as a whole, let alone in queer YA, but you’ve now had two beautiful books—one queer, one not—with Black leads and gorgeous covers that feature them. What has that experience been like, and do you have any tips for authors who’d like to follow in your lead but feel shut out by the publishing industry? I can honestly say that I’d never considered my own identity so much as I did once I got my deal. It felt like all of a sudden it MEANT so much more and there were so many questions to answer and things people wanted justified and realising how much my identity was truly going to play into this career I was just starting out on…it was overwhelming. What’s kind of funny and kind of embarrassing is that in the beginning of my writing journey, I didn’t think too much about writing black characters. Like many POC authors I defaulted to writing white characters, and then by the time I wrote what became my debut and wrote my first black lead, it wasn’t a calculated move on my part—I hadn’t had some awakening and realised what I wanted to write. I just thought—hey, what if this girl was black? And it was only once I had sold that I really began to understand how lucky I was to have sold a black girl book and what I was up against. Now I write my black girls—more often than not queer, now, too—as a kind of defiance, and honestly, I’d encourage anyone wanting to take a similar path as me to do the same. Writing marginalised characters means dealing with aggressions both micro and macro from people across the industry, and facing an even steeper climb to success. In hindsight, I’m glad I wasn’t fully aware of how hard it would be because maybe I wouldn’t have gotten this far—but I want anyone reading who dreams of selling characters with black, queer leads to know it is possible and it feels amazing and my rage only serves to fuel my writing nowadays. So let your anger fuel you, too. And since you mentioned my gorgeous covers (the first by Sarah Creech and and the second by Michelle Taormina) which are such a positive in the whole experience, I should say something else positive too—because it’s not all terrible, of course not. There is no better feeling than someone saying “that girl looks like me”, someone reading and saying “this character is black the same way I am”, knowing that at least one person out there is going to see themselves in your words. And selfishly, for myself—these are the books I wish I had read as a teenager: complex black girls, queer girls, living their lives. You might have the most similar taste in contemporary YA to me of anyone else in bookworld, so of course, I have to mine your brain for some recs here. 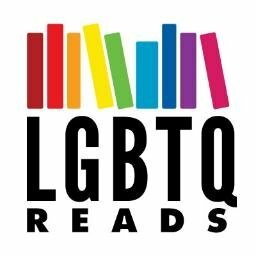 What are your favorite queer books (YA or not) that you’d love to see find more readers? What’s the first LGBTQIAP+ experience you saw onscreen or in a book that really resonated with you? You know, I’ve only really started to find queer media I connect to in the last couple of years, even though I’ve seen a decent amount over the years (I mean hello I’ve been watching Grey’s Anatomy for the past century). So really the first was Emi in Everything Leads to You, as a queer, artistic, mixed race black girl. I know you’re a tattoo person, which is something I always find immensely fascinating. Have you gotten tattoos for your books, and if not, what would you get if you did? Right now I have one book tattoo, for You Don’t Know Me But I Know You. It’s not really specific to the book but one of my favourite artists does these heart-and-hairgrip tattoos and I thought it would be a perfect representation of Audrey and Rose. I’m still thinking about what to get for This is What it Feels Like…I feel music-based is a touch too on the nose, so maybe something baked goods-themed? I’m open to suggestions! Nothing official yet but I hope to be bringing you more queer girls of colour soon, perhaps dusted with a little more darkness this time.